It’s Google’s 12th Birthday. You’d probably realized that if you’ve visited the search engine’s home page — the logo has been replaced by an image of a cake created by American artist Wayne Thiebaud. Although Google celebrate September 27 as their official birthday, the company was incorporated on September 4, the first technical specification appeared on September 20, and the first employee was hired on September 21, 1998. The Google.com domain name was registered on September 15, 1997. Whatever you think of the company, it’s difficult to imagine a web without Google. Things would have been very different had Microsoft, Netscape or any other company dominated the landscape. Most of us use the search engine and several other products such as GMail, Docs, Analytics, Adsense, Reader, or Chrome. Google already produces Android, their mobile platform, and Chrome OS should appear within the next few months. The company and profits have grown exponentially, which is incredible when the majority of Google’s output is given away for free. It’s a model much envied by the old shrink-wrap software producers. 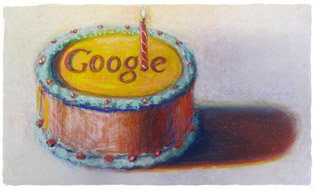 Happy 12th Birthday Google. The first 12 years have been amazing — what will you achieve by 2022?